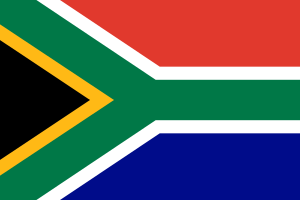 The national flag of South Africa was created in April 1994. It has horizontal bands of red (on the top) and blue (on the bottom), It is separated by a central green band which splits into a horizontal "Y" shape. This page was last changed on 24 October 2014, at 22:36.